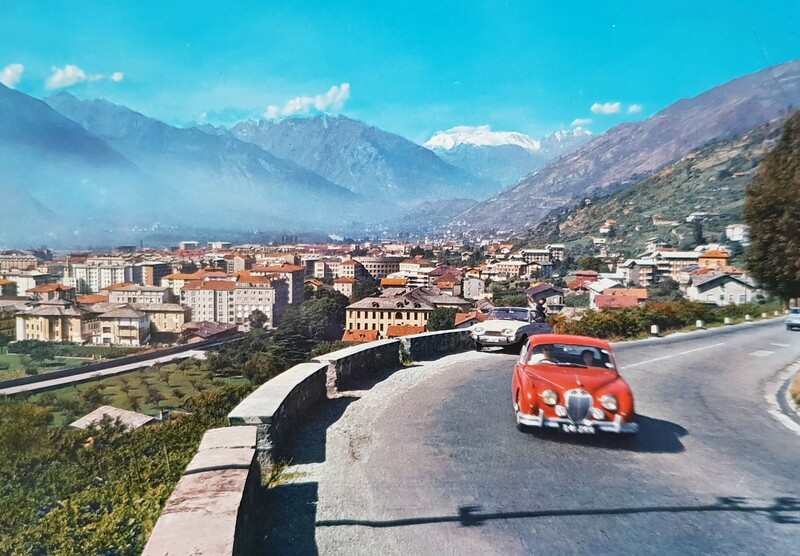 I know we’re supposed to be looking at the Rutor Glacier in the background, but it’s a shame the Italian photographer didn’t get that British registered, right-hand drive Jaguar Mk 2 in focus. This is Aosta in the Italian Alps. My guess is they were coming down from Geneva and heading towards Turin. A nice car for such a journey. I like that the he’s got the opening front quarter light open. I miss them on modern cars. The Jaguar Mk 2 was produced from 1959 to 1967 and the Ford Taunus behind from 1960. This postcard was posted in 1966 to Tours in France. Here are links to a few of my other Jaguar postcards. YYB 611N How are you? There are more. Just use the search box to search for Jaguar.